If you have practised Reiki for a sufficiently long time, you will know that there are some problems and patterns that are highly stubborn. These could be physical, mental or emotional issues. Often, just channelling Reiki is enough. The energy manages to set things right over time and brings the body back into a state of harmony and balance. However, there are some kinds of blocks that are highly stubborn and almost tend to resist any kind of an intervention. Such blocks could be compared with water pipes that are blocked due to obstructions of any kind. In such pipes, there is no way the water can flow freely until the block is removed. In cases of stubborn patterns, the energy is like the water that is unable to flow freely until the block (physical/emotional/mental) is cleared from the energy field. In such cases, the violet flame is a powerful tool that can come to our aid. The Violet Flame is associated with the seventh ray of spiritual light. It is said that, in the past, the power of the violet flame was known only to a few Ascended Masters and other Higher Beings. But in the New Age of today, its power is being made available to all those who are ready to work with it. Saint Germain is the Ascended Master responsible for making the power of the violet flame available to the world today. The power of the violet flame ensures that it not only absorbs energetic patterns and debris from the aura, but it also transmutes them into light. This technique of healing with the violet flame is particularly effective after one is attuned to the Master Degree. However, it can fetch results after other degrees as well (depending on how deeply connected the healer is to energy work). Many people who go on to do the Master Degree are highly sensitive to energy and they can literally play around with energy to heal! So, if you resonate with the idea of using the violet flame to heal stubborn patterns in yourself or others, here is how you can go about it. Take three deep breaths and prepare yourself for the healing. Imagine a violet fire burning in front of you. If imagining is difficult, you can also use a violet coloured candle and look at its flame as the violet flame. Open up the fingers of your hand/hands. If you wish to, imagine them being extended so they can reach the block easily. Sense the energetic block in the body and start scooping it out with your fingers. As you scoop it out pour the energetic debris into the violet flame. If you are using a candle, you will pour the debris over the visible flame of the candle. As you pour the debris into the violet flame, you can visualise it being transmuted into light. Do this process for as long as you feel like. Once you feel you have cleared enough for one session, you can stop. Now visualise the violet flame turning off. If you are using a candle, put it off. Proceed to do a full body healing with Reiki, paying particular attention to the area that was treated with the violet flame. While treating that area, visualise it being flooded with Reiki. Also, visualise it being whole and healed. Once you are done with the full body healing, express your gratitude to Reiki, Archangel Michael, Archangel Raphael and other higher beings you may have called upon to assist you with healing. Drink lots of water and relax. 1. Keep in mind that blocks that require the power of the violet flame may take time to heal. The bigger the block, the more the time. So, you might have to use the violet flame continuously for some sessions to achieve a full healing. This process can go on for a few days, a few months and occasionally even years. 2. This is a very high level of energy work and it can sometimes be followed by a healing crisis. It is recommended that you work with this only if you are very comfortable with energy work and can support yourself in the event of a healing crisis. 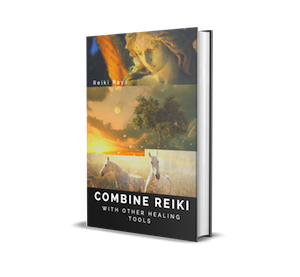 I have sent you both Reiki eBooks. I loved this article, thank you!!!! Sounds interesting. I read your Reiki Ray articles first thing when I wake up every morning. Thanks so much. Necesito sanacion con la llama violeta. whenever I close my eyes and practice reiki or when I meditate I see a violet spot in front of me. I’ve always wonder what it means. Is it maybe the violet flame? That is more likely to be connected to the opening of the third eye. The colour associated with the third eye is close to violet. Thank you so much. A wonderful technique. I thank you for the explanation of the violet flame. I have been experiencing this in my Reiki practice. I have learned to focus the light for the intent of the outcome on the people I am treating. Sometimes I feel dehydrated after a session focusing on this technique. Now I understand why. Add a 144-sided vogel crystal to that healing and you get a super laser beam for psychic surgeries. It is very higher healing technic. So we have to learn certainly. Thank you for this article. I love reading your articles. This violet flame is very interesting. I am having a doubt. violet is related with sahasrar. and indico is related with third eye. kindly clarify. I am burning the debris in blue flame wich related with throt Chakra. I need your support pls send me the e mail. I wish to learn a lot from you. thanks to you and I will pray the highpristess to shower intuition power to you. Dear Haripriya, I could come to know about you while searching about Reiki healing. I started learning in the very recent past. COuld you assist me with the document to learn further on the magic 7 layers ? Thank you for such a lovely article, all your articles are amazing and true to light. Namaste ?